Hello Crafty Friends! 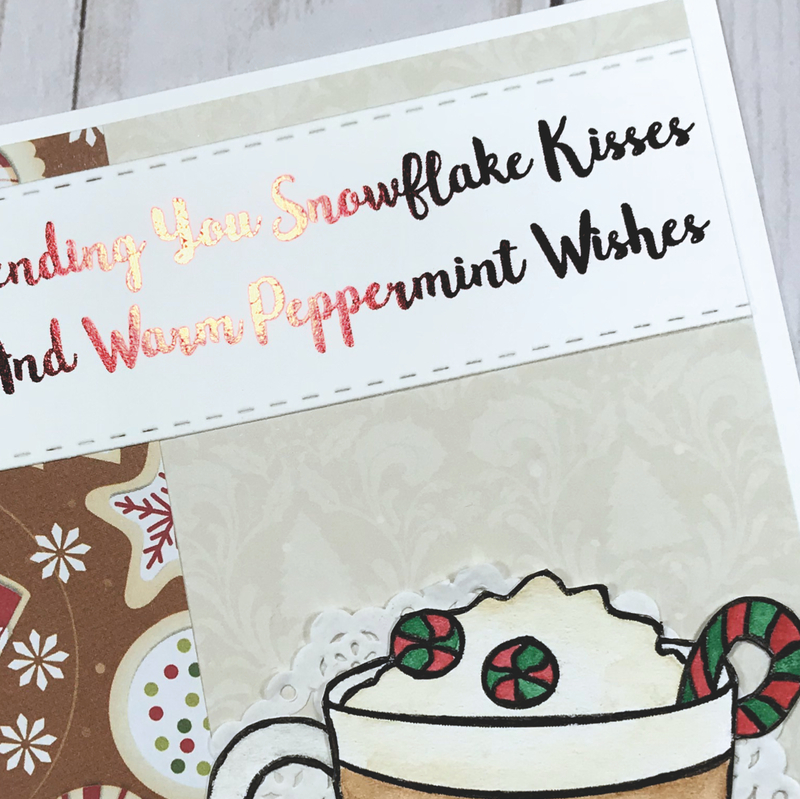 I’m back again with another card for the Coffee Lovers Blog Hop. I am also one of the many wonderful sponsors for that blog hop. In addition to sponsoring this week’s amazing Fall/Winter Coffee Hop I have some awesomeness going on here at my blog. This awesomeness includes a freebie digi set for everyone, an amazing sale in the store, and a giveaway. All information about this weeks awesomeness can be found here. Now that I’ve talked enough business, let’s talk a bit about this card. It’s hard to tell in the photo but that sentiment is foiled in red. This is the first time I have ever used foil and I have to tell you it is AWESOME. I’m not going to get into too much detail because I have more coffee cards to make but I can assure you there will be a lot more foiling in my future and more detailed tutorials for those of you who what to know exactly how it is done. So, the cup image and sentiment are both from the Peppermint Snowflake Mug freebie digi set I created for this blog hop. The mug was printed on watercolor paper and painted with Prima Watercolor Confections and cut out the fussy way. I kept the paper layers simple with some pattern paper from my craft stash and a Doodlebug Mini Doily. By the way, I love those little doilies, they are just way too cute and make it super easy to add a nice touch to any card. Thanks for stopping by, It’s time for me to make more coffee cards. Make sure to visit the Coffee Lovers Blog and link up a new coffee crafty creation. Super CUTE, love the added foiling! That is a gorgeous card design. I always love to see foiling on cards too. Pretty card and I love the foiling. The sentiment is sweet. Such delightful card, very sweet! Wow, what a beauty. Love the foiled lettering! this is so darling card! This is warn, adorable and delicious. Love your card! Foiling is the best isn’t it? ?